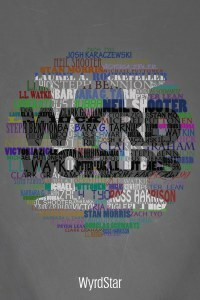 Please tell us about your work with the Wyrd Worlds books: I actually reviewed the first edition of Wyrd Worlds on my blog, http://indiebookreviewer.blogspot.com and fell in love with both the concept and all the authors. Each one provided a wonderful story that was thought out and fun to read. Where did the idea for these stories come from? For my anthology story “My Last Day” I really drew from an emotional place, and tried to convey that. As a father, being helpless to protect the ones you love is a real fear and made it a story that was surprisingly easy to tell. Do you have any phobias? Though my current occupation forces me to interact with them almost daily, I still have a fear of spiders. Every house spider is a brown recluse, and every small hairy spider is a tarantula. What have you learned from your experiences with this anthology? Well the main thing I’ve learned is Steph Bennion is a work horse. As a fellow contributor, editor and publisher she put more blood, sweat and tears into the overall work then anyone realizes….hopefully not too much blood though. What three pieces of advice would you give to new writers? Never stop writing. Don’t do it unless you love it. When rejection is up and sales are down, only someone who truly loves the industry has a prayer of longevity. Finally, get a Goodreads.com account, read, and pick the brains of every author who will listen. You can never fully understand the business until you get into it, but the authors on the site can give you the best chance for a positive experience. Most authors like to read, what have you recently finished reading? Did you enjoy it? Reading has always been something I’ve been passionate about. The only difference now is what I read. Fantasies were always my “wheelhouse”, which later evolved into thrillers. For the past year, or so, I’ve been reading indies of every genre. I still pick up the occasional Dean Koontz book, but mostly I stick to my indies that I’ve become a fan of. My most recent book is a collection of Poe’s short stories. What are your opinions about authors commenting on reviews? How important are reviews, in your opinion? Honest reviews are invaluable to an author. When you’ve received enough it gives you an idea of what the general public thinks of your writing. As far as a reader goes, at least from my experience, they matter a little less. So many people pay for 5* reviews that now when a reader sees an indie story with a dozen 5* reviews they automatically think that they could not possibly be as good as they seem. Who are your influences? I take my influences from many of the usual. When I was younger I imagined writing epic fantasies like R.A. Salvatore, and as I grew I feel in love with Dean Koontz’s style of sprinkling supernatural traits into thrillers. Now that I’m actually writing, I find myself taking a lot of inspiration from Poe. What can we expect from you in the near future? I recently released my first book The Reaper’s Opus which is a short story collection following mortal’s interactions with the Reaper at the end of their lives. I’ve currently been working on my next book that follows a man working at a private hospital for plague victims.